Lupinus bicolor is often included in wildflower seed mixes. 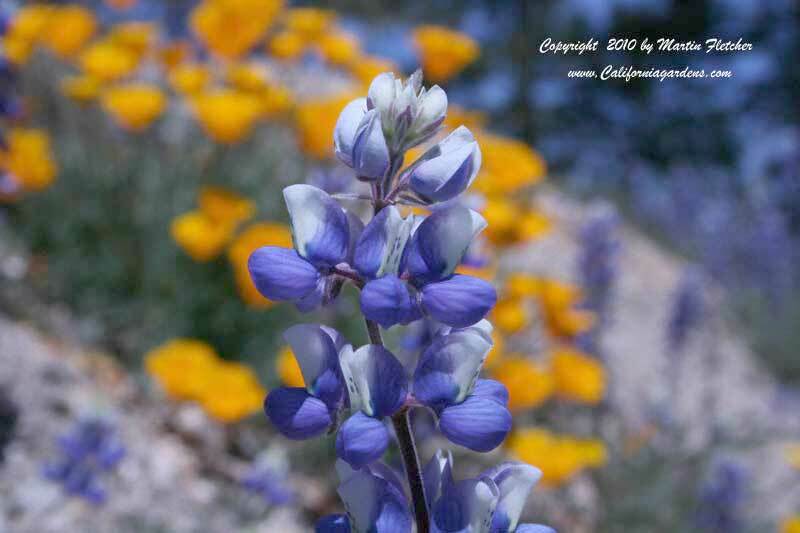 The Miniature Lupine is about the same height as the California Poppy at about a foot tall or maybe a little less, and can often be found blooming together in the wild. The blue flowers contrast so nicely with the orange. Lupinus bicolor is often found covering whole hillsides, but is just as often mixed in a meadow setting. In mass - you smell Lupinus bicolor before you see it. It is best to spread seed with the first significant rains in the Fall. Lupinus bicolor is a common nectar source for the Orange Sulphur Butterfly. Blue and white flowers of Lupinus bicolor - Miniature Lupine with a background of poppies. High resolution photos are part of our garden image collection. High resolution photos of are part of our garden image collection.